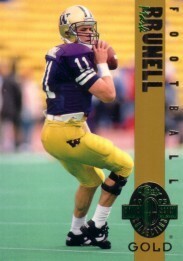 1993 Classic 4-Sport Gold card of former Washington Huskies star quarterback Mark Brunell, who later became a Pro Bowler with the Jacksonville Jaguars. NrMt-Mt or better. ONLY ONE AVAILABLE FOR SALE.